The last fifty years has seen a worldwide trend toward constitutional democracy. But can constitutionalism become truly global? Relying on historical examples of successfully implanted constitutional regimes, ranging from the older experiences in the United States and France to the relatively recent ones in Germany, Spain and South Africa, Michel Rosenfeld sheds light on the range of conditions necessary for the emergence, continuity and adaptability of a viable constitutional identity - citizenship, nationalism, multiculturalism, and human rights being important elements. The Identity of the Constitutional Subject is the first systematic analysis of the concept, drawing on philosophy, psychoanalysis, political theory and law from a comparative perspective to explore the relationship between the ideal of constitutionalism and the need to construct a common constitutional identity that is distinct from national, cultural, ethnic or religious identity. 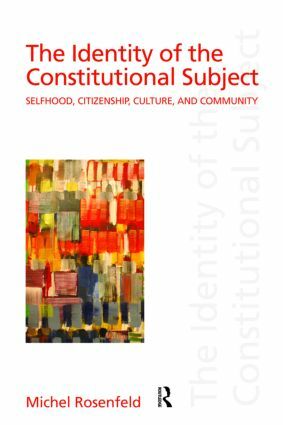 The Identity of the Constitutional Subject will be of interest to students and scholars in law, legal and political philosophy, political science, multicultural studies, international relations and US politics. Why Constitutional Identity and for Whom? The Constitutional Subject: Singular, Plural or Universal? The Constitutional Subject and Clashing Visions of Citizenship: Can We Be Beyond What We are Not?